Includes a multi-point inspection and a complimentary car wash.
*Plus tax and shop supplies. Coupon not valid with any other offer. Must present coupon at time of purchase. Limit one coupon per person. Coupon does not apply to prior purchases. Other Restrictions may apply. See your Willis INFINITI Service Advisor for details. Schedule your Complimentary Alignment Check today! If an alignment is needed, prices start at $89.99 for a Front Alignment and $129.99 for a 4-Wheel Alignment. A Front or 4-Wheel Alignment includes a multi-point inspection and complimentary car wash.
*If alignment is needed, tax and shop supplies will be added. Coupon not valid with any other offer. Limit one coupon per person. Coupon does not apply to prior purchases. Other Restrictions may apply. 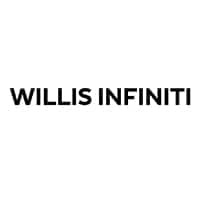 See your Willis INFINITI Service Advisor for details.